Yes. Participants must be 10 years of age. Additionally, we ask that everyone is in good physical condition. Yes. All participants must be at least 70 pounds and not more than 250 pounds. We will weigh our guests if necessary. How long is each zipline course? We offer the 1 Hour and 2 Hour Tour. The 2 Hour Tour consist of over 6,000 feet of cable! You go on 13 zips ranging from 250 feet to 1000 feet and 3 sky bridges. 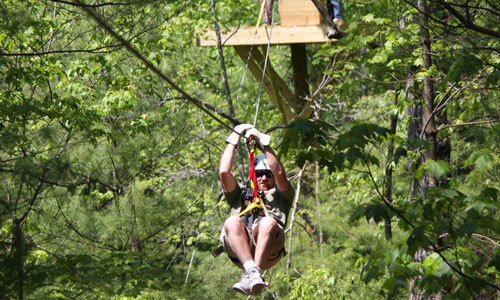 You'll zip through treetops ranging from 25 feet to 75 feet high. The 1 Hour Tour is simply half of the longer tour, but still gets great reviews as well! 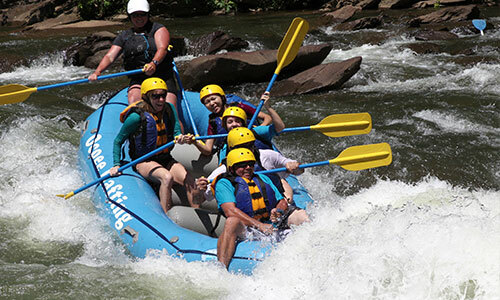 We offer group rates for groups of 10 or more on select days. Discounts are not offered on Saturdays. Please visit our Facebook page for special offers and discounts, as well as our home page for off season discounts. Shoes: We require everyone to wear closed-toe shoes, such as hiking or running shoes. Sandals are not allowed. Shirt: Must cover full back and shoulders. No tank tops or bathing suits. Pants: Comfortable but not too short. Mid thigh shorts, capris, or long pants are best. No jewelry, scarves, or other items that could get caught in a cable are allowed. Keys, cell phones, and wallets should not be taken. You're welcome to leave your keys in our office before your trip. We run our trips rain or shine. If we do not call you, the trip is going. Even if there is bad weather where you are, that does not necessarily mean there is bad weather at our office. 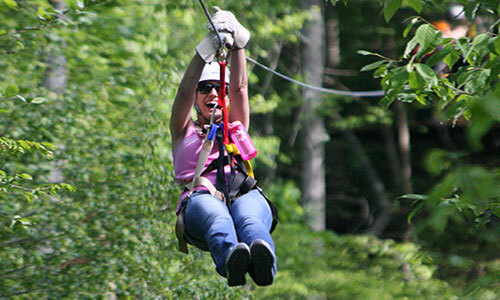 When do you offer zipline tours? Tours are offered all year, but only select days in the off season. 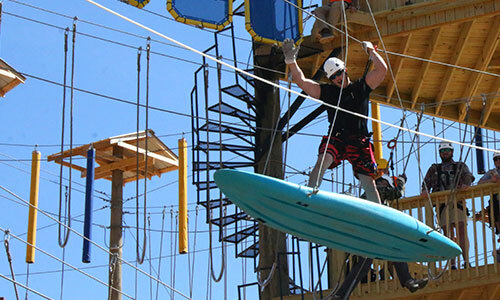 Call our office at 800-251-4800 or visit our Zipline Calendar for availability. Will there be photos taken? During our busy season photos are taken, but we do not guarantee that they are taken on every tour. What time should I arrive for my trip? Our check-in time is the trip time. However, if you want to arrive 10-15 minutes early that is fine. We do not recommend that you arrive any earlier than 15 minutes prior to your trip time. It is always better to be early rather than late, due to the fact that we do not delay our tours. For example, if you purchased tickets for a 12:30 tour you can arrive between 12:15 and 12:30. If you arrive more than 10 minutes late, you will have missed your tour and all payments will be forfeited. Do you need previous experience? No. 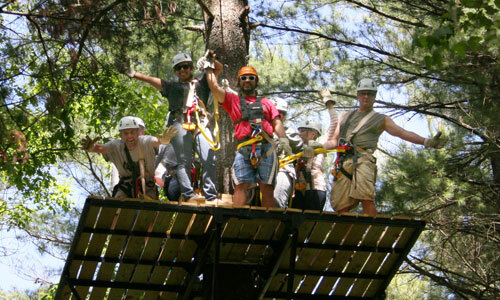 Two guides are on each tour that will send and receive the guests on each zipline. Reservations are highly recommended, because we fill up quickly and if you do not make a reservation you will not be guaranteed a spot.